Citation: Abd El-Wahab, M Attia , WA Hassan, et al. Preparation and Characterization of Nano-copolymers (Styrene/2- Ethyl Hexyl Acrylate) based on Two Different Surfactants and Use it as a Binder for Surface Coatings. Nano Tech Nano Sci Ind J. 12(2):127. Nano emulsion copolymers are stable liquid-in-liquid dispersions. Smaller particle size tends to result in promoting key properties such as high surface area per unit volume, gloss, washablity, viscosity, and stability. Thus, new nano-styrene acrylate copolymers based on 2-ethyl hexyl acrylate monomer using two different surfactants, were prepared by emulsion polymerization and formulated as a binder for water based paints, with a view to gaining potentially useful properties. These nano emulsion copolymers were confirmed and characterized by means of IR, GPC, DSC, TGA, TEM and zeta potential. The prepared nano-copolymer showed an enhancement in solid content and viscosity, and also revealed an ideal glass transition temperature for a coating formulation. Finally, we compared the results obtained for the prepared nano-copolymers with a commercial styrene acrylate copolymer, with respect to use as a binder for paints. The results obtained indicate that the prepared nano-copolymers can be used as a binder for paints, with the advantage of improvement in both film properties and mechanical properties of the paints. Research into waterborne coatings is a fast growing area of research because of environmental concerns over volatile organic components present in traditional solvent based paints [1,2]. Acrylic and latex paints are very similar in that they are both classified as water-based coatings that are produced from acrylic resins. Both are widely used as industrial coatings . Acrylic copolymer nano-emulsions were prepared based on Methyl Methacrylate (MMA) and Butyl Acrylate (BA). The prepared polymers were used for pre-tanning of the de-pickled hide to enhance the physico-mechanical properties of tanned leather, with the hardness and flexibility of the copolymer being a function of the composition of the monomer. In general, acrylic ester copolymer nano-emulsions are of immense importance for industrial applications . The polymer emulsion of styrene and acrylate monomers shows advantages with respect to weather resistance, stain resistance, gloss and color retention resistance. Also, the film compactness of the styrene-acrylic emulsion can be improved by decreasing the particle size of the emulsion copolymer, to gain useful properties in the coating application. The formation of polymer particles takes place by entrapment of radicals in micelles (micellar nucleation), precipitation of growing oligomers in the continuous phase (homogeneous nucleation entrapment of radicals in monomer droplets (droplet nucleation) [5,6]. In the case of micellar nucleation, the micelles compete with monomer droplets in capturing free radicals due to their relatively large surface area . Butyl acrylate-styrene (BA/ST) nanoparticles were prepared by various methods such as ultrasonic emulsifier-free emulsion polymerization . Most commercial latexes are copolymers designed by the simultaneous copolymerization of two or more monomers. The eventual latex properties are determined by the copolymer composition, molecular weight distribution and particle morphology. To control these properties, many operative variables can be used (temperature, initiator, and co monomer(s) types and concentration. In view of this, acrylic acid was added to modify the styrene acrylate copolymer during latex synthesis , and semi continuous emulsion polymerization, hetero-phase polymerization with reactive surfactants (or by non-seeded semi-batch emulsion polymerization), were carried out with different applications for this type of copolymer [10-12]. This work is designed to prepare St/2-EHA binders to be introduced into coating applications. The results obtained for the properties of the coated films of the formulation based on the new nano copolymers as a binder, were compared with the properties of the coated films for a formulation based on the commercial binder (Arakril ADC750,) as shown in the manuscript. Styrene (ST), 2-ethyl hexyl acrylate (2EHA) acrylic acid (AA) and acrylamide (AAm) monomers were products from Elf Chem. (ATO) Company France. Potassium persulfate “KPS”, laboratory grade chemical and Texapon “SLES”, were purchased from Sigma Aldrich Germany and were used as received. Nonyl phenol ethylated (NP30) was from DOW Company. Desponil LDPS 25 was from BASF SE Germany. Ammonium hydroxide and sodium acetate, for pH control and regulation respectively, were obtained from El-Nasr Chemical Industries. Titanium dioxide Kronos 2300 was from KRONOS TITAN GmbH. Pre-emulsion preparation: Distilled water, ionic surfactant, styrene, 2 ethyl hexyl acrylate, acrylic acid and acrylamide monomers were added into a glass beaker and stirred at 1000 rpm for 30 min to obtain a homogenous pre-emulsion. Polymerization procedure: Semi-batch, or semi-continuous emulsion polymerization, was undertaken using a 1 L stainless steel reactor equipped with a reflux condenser, stainless steel stirrer (Heidolph Gmbh. ), and 2 separate feed streams. The first feed stream was a mixture of pre-emulsion, whereas the second feed was the initiator solution. Before emulsion polymerization was instigated, the reaction Vessel was initially charged with the desired amount of water, plus NP30 as the non-ionic surfactant and sodium acetate as a buffer, with the items being added in this particular sequence. The reaction temperature was maintained at 80˚C during the polymerization and the reaction mixture was stirred at a rate of 150 rpm. After 5 min, 5% of the pre-emulsion mixture total was added over 15 minutes (Seed reaction). An amount of initiator solution and was then added to the remaining part of the pre-emulsion and stirred for 5 minutes. The monomer mix (pre-emulsion) was then slowly and continuously added together with the remaining amount of the initiator aqueous solution over a 4 hour period. The reactor was then held at 80˚C for 1 hour to remove any free monomer(s). The reactor was then cooled to 30˚C and the pH adjusted to 8 using ammonia solution. Following neutralization, the addition of biocide to the latex was undertaken and then the material was filtered with a 100 mesh filter and collected. The polymerization procedure is represented in TABLES 1 and 2 for two different surfactant combinations (Texapon and NP30, Desponil LDPS 25 and NP30). The reaction is represented in scheme 1 . Scheme 1: Chemical structure of the prepared St/2EHA Nano emulsion copolymer. Table 1: Formulation of the prepared latexes using texapone as an anionic surfactant (polymer A). Table 2: Formulation of the prepared latexes using Desponil LDBS 25 as an anionic surfactant (polymer B). Fourier transform infrared (FT-IR): The copolymer composition of the dried samples was identified by FT-IR analysis. The instrument utilized was a JASCO FTIR 6100 covering the wavelength range of 4000 cm-1-400 cm-1. Transmission electron microscopy (TEM): The morphology of the copolymer particles was examined using transmission electron microscopy. In TEM the dry sample has to be transferred into an ultra-high vacuum and is exposed to a high energy beam of electrons (for example100 keV). Transmission electron microscopy (TEM): The morphology of the copolymer particles was examined using transmission electron microscopy. In TEM the dry sample has to be transferred into an ultra-high vacuum and is exposed to a high energy beam of electrons (for example100 keV). Thermo gravimetric analysis (TGA): TGA analysis was performed using a Shimadzu TGA-50 thermo gravimetric analyzer, Columbia, EUA, in a nitrogen atmosphere using a heating rate of 10 ˚C /min in the range between room temperature and 600˚C. Differential scanning calorimetric analysis (DSC): Tg of each copolymer sample was measured using differential scanning calorimetry analysis. DSC analysis was carried out usin a Shimadzu DSC-60 differential scanning calorimeter Columbia, EUA. All samples were heated with a scan rate of 10˚C /min over a temperature range of -60˚C to 110˚C in a nitrogen atmosphere. Gel permeation chromatography (GPC): The weight-average (Mw), and number-average (Mn) molecular weights, were determined using a Agilent 1100 series gel permeation chromatography (GPC), Germany, equipped with G1362A refractive index detector with 100-104-105 A° ultra styragel columns. Dynamic light scattering: The particle size and particle size distribution of the prepared copolymer were determined by dynamic light scattering, using a Malvern Zetasizer Nano, UK. This instrument was used to measure the hydrodynamic size in the range of 0.4 nm-10000 nm. The number of single measurements of particle size was calculated as the average of three experimental determinations. The same instrument was used to measure the zeta potential values of the prepared copolymers in the range of -200 mV to +200 mV. Viscosity measurement: The viscosity of the prepared copolymer samples was measured using a digital viscometer manufactured by the Sheen Company, which is normally used to measure paint formulations. For all the emulsions, the viscosity was measured using a Brookfield RVDVE-II+Pro Viscometer. Gloss test of paint samples of prepared latex: Paint samples were applied on glass panels using a SIMIX film applicator and left to dry for 48 hours before undertaking gloss measurements using a mini-gloss 60° gloss-meter manufactured by the Sheen Company. Wet scrub resistance (washablity) test: A SIMEX film applicator was used to apply the paint sample to be tested (against a typical commercial sample) onto a clean glass panel of suitable dimensions. The sample was then left to dry for 24 hours and subsequently left for 1 week, prior to undertaking the washablity test procedure. This involved placing the paint panel into the wet abrasion scrub tester REF 903, with the test being carried out according to ASTM D2486. Dry film hardness measurement: The scratch hardness of the prepared polymer dry films was estimated by means of the pencil hardness test. The test procedure was carried out using a Sheen Pencil Hardness Kit, which was accompanied with a set of calibrated wood pencils with a scale of hardness 6B (softest) through to 6H (hardest). Dry film adhesion measurement: This was undertaken using the cross-cut test method. The method was used for determining the resistance of the copolymers to separation from the substrate. The method utilizes a tool to cut a right-angled lattice pattern into the coating, which penetrates all the way to the substrate. The cross-cut test instrument used was manufactured by the Sheen Company. IR spectroscopy of the prepared nanocopolymer: In order to explain the copolymer composition, FTIR analysis was performed for the copolymers as an arbitrary copolymer and for the emulsifier system (Texapon and NP30) as shown in FIG. 1A and 1B. The spectrum data signifies the following bands: the aromatic C-H stretching frequencies at 3030 cm-1, 3063 cm-1, 3086 cm-1 and 3104 cm-1 concern the styrene ring. The value of the carbonyl stretching frequency is 1727 cm-1. The bands at 1638 cm-1 and 1450 cm-1 can be assigned as the ring stretching modes of styrene. 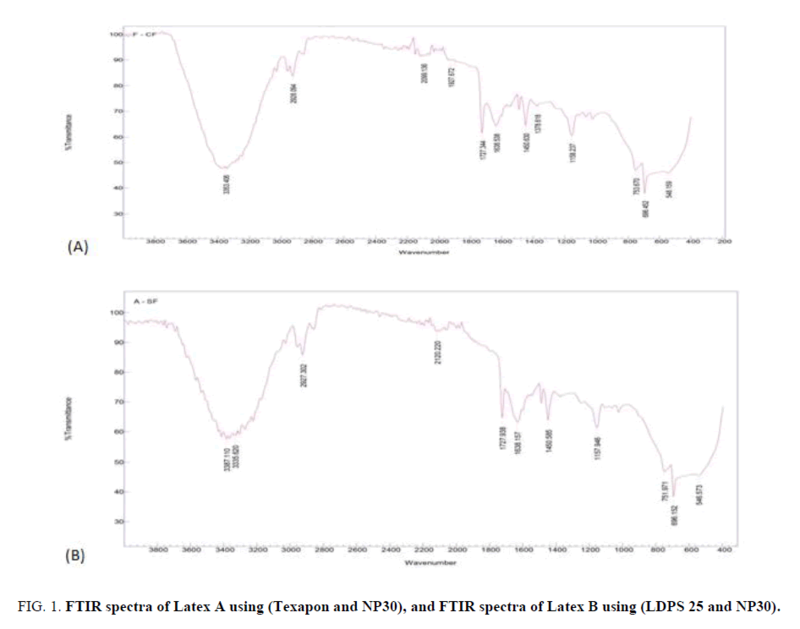 Figure 1: FTIR spectra of Latex A using (Texapon and NP30), and FTIR spectra of Latex B using (LDPS 25 and NP30). The band at 751 cm-1 is due to the out of plane C-H bonding mode of the mono substituted benzene. C-H out of plane deformation occurs at 3060 cm-1 and at 1638 cm-1 . Also, several characteristic bands of both styrene and acrylic acid are present. The band at 1727 cm-1 is characteristic of the non-bonded and hydrogen-bonded carbonyl groups in acrylic acid segments of the copolymer, respectively. The band at 2927 cm-1 is specific of a aliphatic hydrocarbon group of 2-ethyl hexyl acrylate. The ionization of acrylic acid due to the presence of a neutralizing agent is responsible for the presence of the intense peaks at 3335, 1727, 1450 and 1157 cm-1. These correspond to N-H stretching, C=O stretching and C-N stretching due to the acrylamide group. Molecular weight: The characteristics of acrylic resin-coatings are generally associated with the molecular weight and the co-monomer ratio. Also, toughness, abrasion resistance, or impact resistance of the final coatings can be enhanced with the escalation of the molecular weight of polymers. Nonetheless, the incorporation of a co-monomer usually modifies the glass-transition temperature (Tg) and the molecular weight and that’s why the mechanical properties of the final product can be improved . Reaction property originates from the participation of the propagating radicals, which diminishes the termination rate . The Molecular weight obtained by GPC for the two different prepared copolymers are shown in TABLE 3 and FIG. 2A and 2B. Figure 2: The molecular weight of the prepared Latex A using (texapone and NP30), and the molecular weight of the prepared Latex B using (Desponil LDPS 25 and NP30). Thermal analysis of the prepared copolymers: I. Differential scanning calorimetry (DSC): To appreciate the importance of these prepared copolymers for water based coatings, glass transition temperature “Tg” should be in the range of 20˚C to 45˚C. Thus, Tg is important in describing the properties and potential end use of a polymer. Transition glass temperature (Tg) and crystalline melting temperature (Tm) are the most important properties that characterize the thermal properties of polymers. When a polymer cools below its Tg down, the amorphous domains of this polymer cease thermal motions and then rigidity, brittleness, and stiffness are introduced to the polymer. Since 2-EHA homopolymer has a “Tg” of -65°C and can easily emulsion copolymerize with Styrene monomer has “Tg” 100°C, the Tg values of the produced copolymer films can be tailor-made for specific applications. The DSC curves of all prepared dry lattices films are indicated in FIG. 3A and 3B. Figure 3: DSC curves for Latex A using (texapone and NP30), and DSC curves for Latex B using (Desponil LDPS 25 and NP30). The DSC thermo grams in FIG. 4A (using Texapone anionic surfactant) and FIG. 4B (using Desponil LDPS 25 anionic surfactant) explained that, no endothermic shifted in “Tg” value for the prepared co-polymers because the fixed chemical structure of two polymers. DSC data are given in TABLE 4. Figure 4: TGA curves for latex A using (texapone and NP30), and TGA curves for latex B using (Desponil LDPS 25 and NP30). Table 4: DSC decomposition temperature of the prepared copolymers (polymer A and B). II. Thermo gravimetric analysis (TGA): Thermo gravimetric analysis (TGA) has proved to be a suitable method to investigate the thermal stability of polymeric systems. The knowledge of degradation and mode of decomposition under the influence of heat is highly recommended for the optimization of process parameters. The threshed decomposition temperature gives an indication of the highest processing temperature that can be used. It is evident that the thermal degradation process for all polymer samples proceeds in one step. The initial decomposition temperature was 383°C and 481°C, respectively. The final decomposition temperature was at 408.28°C and 405°C, respectively. Weight losses were 93.8% and 94%, respectively. This means that the Chemical structure played an important role in the thermal decomposition and, the variation in emulsifier system had no effect on the latex thermal stability. The TGA curves of the prepared copolymers are shown in FIG. 5A and 5B. The TGA data are also given in TABLE 5. It is noticeably seen that the weight of the sample continuously decreases as the temperature increases. Figure 5: TEM image for latex A average (140 nm), and TEM image for latex B average (70 nm). Table 5: TGA data of the prepared copolymer (polymer A and B). Morphology of the polymer: TEM images of the particles with different emulsifier systems (Texapone to Desponil LDBS 25) can be observed and it rearranges them to a thermodynamically stable morphology. Also, it is clear that from the uniform particle size, that very low coagulation occurred during the polymerization reaction . In this work, the second stage monomers, “acrylic acid and acrylamide”, were polymerized in the presence of the core seeded latex. The latter can either be formed in dead seeding or in situ during the emulsion polymerization i.e., live seeding [16-18]. TEM micrographs are shown in FIG. 6A and 6B respectively. It can be shown that there is a slight difference in contrast between the outer and inner portion of the particle. The TEM images of the core-shell particles with the different emulsifier system from (texapone and NP30) to Desponil LDPS 25 and NP30, were between 70 nm-140 nm with a narrow particle size distribution. 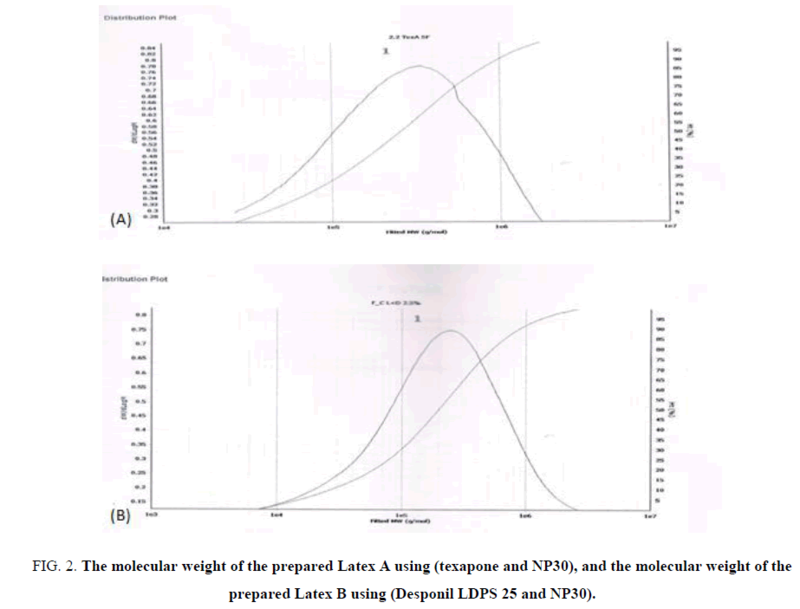 Figure 6: Particle size distribution for latex A using (texapone and NP30) and Particle size distribution for latex B using (Desponil LDPS 25 and NP30). Zeta potential: Normally, emulsions that have zeta potentials higher than +30 mV or lower than -30 mV are considered stable . Therefore, it can be concluded that all prepared emulsions had good dispersion stability. Increasing the zeta potential is a driving force to prevent particles from stacking. This leads to the creation of nano scale stable particles and by viewing TABLE 6 and FIG. 7A and 7B, for the particle size distribution of the latex, it can be observed that increasing the emulsification system concentration enhances the stability, as seen by the measured zeta potential values. The number of micelles increased with the increasing surfactant content, therefore more sites for polymerization occurred and latexes with smaller particle size were formed. The surfactant proved useful in controlling the particle size of the latexes . Figure 7: Schematic diagram of reaction between monomers and surfactants. Table 6: Zeta potential of the prepared copolymers (polymer A and B). Adhesion and hardness: The physical properties of latex polymer film, such as hardness and adhesion, are very important criteria in determining its practical application. These physical properties are closely dependent upon the macromolecular structure . Dry film hardness is the ability to resist permanent indentation, scratching, cutting and penetration by a hard object . It can be observed that hardness and adhesion values were improved with the reduction in particle size, which is dependent upon the type and concentration of the emulsifiers system used. The results are presented in TABLE 7, with the results indicating that the largest particle size imported an inherent weakness to the strength property. A possible explanation for the positive effect of smaller particles on adhesion and hardness values, relates to the ability of these smaller particles to pack more tightly together during the drying process . Thus increasing the area of contact between the polymer and the substrate. Table 7: Regression results-Effects of using lights and sirens on transport times. Colloidal stability: The colloidal stability of waterborne dispersions is a very important characteristic. It determines their stable storage period. Kan et al. and Huang et al. have reported that to a certain extent coagulum appeared when polymerization methods were used and the resulting latex material was sensitive to electrolytes such as NaCl and CaCl2. However, in the present work, no coagulum appeared for all the lattices and experimental results revealed that all prepared latexes are initially stable for 1 year. They exhibited excellent performance in terms of shelf-life and this is shown in TABLE 8, as stability of the prepared copolymers against adding electrolyte after 24 hours. Table 8: Stability of the prepared copolymers against adding electrolytes after 24h. (polymer A and B). I. The electrolyte stability: There are important factors that affect the colloidal stability of polymer latexes, such as the concentration of electrolyte that come from ingredients such as the buffer solution, the initiator, and the surfactants. Stability testing was carried out by adding 0.5 g of different concentrations of salts (0.1M NaCl, 0.5M NaCl and 0.1M CaCl2) to 0.5 polymer latex . Immediate flocculation, or flocculation after a certain time, was observed visually. Stability of the emulsions against electrolytes is shown in TABLE 9. Based on this table, it is clear that all the latex samples are generally stable when adding salts such as NaCl, and CaCl2, even up to their saturated concentrations. This good stability may be attributed to the small size of latex particles and the steric and electrostatic stability offered by the synergistic effect of the non-ionic and anionic surfactant combination. These results are in accordance with the results reported elsewhere . v Refer to stable on salt addition. Table 9: Stability of the prepared copolymers against adding electrolytes after one week. (Polymer A and B). II. Freeze-Thaw stability: Freeze-thaw stabilization of lattices is of considerable practical importance due to the need to store and transport these lattices within cold countries during the winter season. When the temperature decreases to a point where the dispersion medium begins to freeze, a third phase (ice) forms when freezing occurs. The water volume available to the emulsion particles progressively decreases, which consequently leads to entrapping of the latex particles between the growing crystals of the solid dispersion medium. Thus, the latex particles are forced into contact with each other . Stability of emulsions against freeze-thaw destabilization is displayed in TABLE 10. Based on the results presented in TABLE 9, the freeze-thaw stability of the prepared lattices is improved. This may be attributed to the use of Desponil LDPS 25 in conjunction with Texapon, resulting in carboxylate Poly (Styrene Acrylate) latex being stable to freeze-thaw cycles. Alternatively, it could be due to copolymerization of small amounts of hydrophilic monomer, such as acrylic acid, which is expected to improve the freeze-thaw stability of the novel prepared lattices. This is possible because these acidic groups may concentrate near the surface of the latex particles, thus preventing inter-particle coagulation. That is why 0.5 wt % of acrylic acid (AA) for each formulation was used in the monomer feed and the final lattices were neutralized with ammonia to improve the freeze-thaw stability of the novel prepared lattices . Table 10: Thaw-freezing stability of the prepared copolymers (polymer A and B). Emulsifiers play two decisive roles in the polymerization processes. One is to stabilize the monomer droplets during the manufacturing process and the other is to stabilize the cured polymer particles in the finished latex. However, the main role of surfactants is to form the micelles that enable the polymerization processes to take place. Anionic emulsifiers form micelles with a spherical structure in aqueous solutions. The free-radical polymerization reaction takes place in these micelles, which take on the function of a “mini-reactor”. The monomer reacts with the water-soluble initiator to form free radicals and diffuses into the micelles, where further chain propagation takes place. These are represented in FIG. 8 which shows a schematic diagram of the reaction. The presence of a large number of emulsifier micelles in parallel creates a series of enclosed spaces in which the polymer particles gradually grow as the reaction progresses. Generally, the amount of emulsifier used in the polymerization process is sufficient to enable high-quality polymer dispersions to be manufactured that do not contain any coagulated solids. However, it is possible that if there was insufficient emulsifier present to be able to form a saturated adsorbed layer on the surface of the particles the latex, then they could be stabilized by means of electrostatic repulsion, or steric hindrance, between the polymer particles. Nonionic emulsifiers can also be added to polymer dispersions to improve their mechanical stability and also their stability in the presence of electrolytes. The type of emulsifier, its consistency in quality and purity, and its composition, influence the formation and particle size, together with the properties of the latex on application. 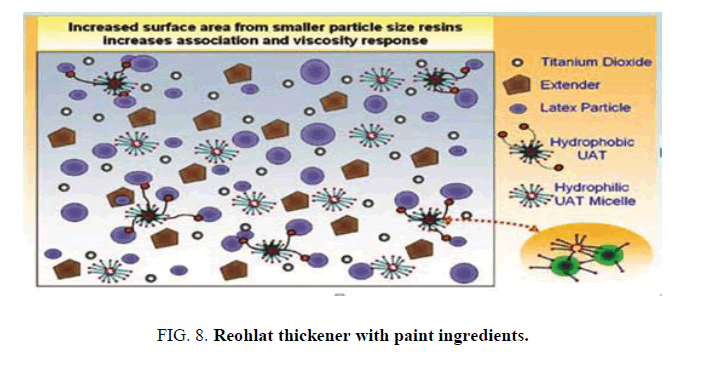 Figure 8: Reohlat thickener with paint ingredients. Effect of anionic surfactant on emulsion polymerization: Surfactants have a strong effect in reducing the surface tension between the water and the air, as well as the interfacial tension between the water and otherwise immiscible liquids such as vinyl monomers. Mahdavi et al. Improve characteristic phase behavior of water and oil by using SDS/SLES with NP30. The purpose of this work is to investigate the effect of the type and amount of surfactant on the overall polymerization features and final product properties for the emulsion polymerization process of styrene, 2-ethylhexyl acrylate co-polymer. The emulsifier systems studied included two types of anionic surfactants: (i) Texapon SLES; (ii) Desponil LDPS 25- beside non-ionic emulsifiers NP30. Texapone (SLES) Desponil LDPS25 (sodium-n-alkyl (C10-13) benzene sulphonate were chosen for this study because, large-molecular-weight and long chain which gives very stable latex with the smallest particle size. The solubilizing power of surfactants increases as use (SLES and LDPS25), and they obtained good results in which particle size, freezing-thaw and the mechanical properties in the result coating film. The solid content and coagulum of the prepared copolymers were determined gravimetrically, with the results being recorded in TABLES 1 and 2. To begin with, the solid content had a somewhat constant value, which can be attributed to the complete polymerization of the monomers that had a constant molar ratio. It was found that solid content depended mainly on the polymerization rate and reaction conditions and marginally on the composition of the monomer. Low solid content values are usually referred to as high percentage coagulation of the solid polymers during polymerization, or the yield of the reactants. This depends on the initiation, surfactant system, and reactivity of the reactants. Coagulum is formed in several emulsion polymerizations, from the smallest laboratory scale to the maximum production reactors. It is detected in many forms, from a single lump of polymer with little or no fluid latex, to tiny sand like grains suspended in a stable latex. Typically, it is found as lumps in the latex, or deposited on the container surface. The polymer system, and the polymerization recipe and technique, affect the type and amount of coagulum produced. Two mechanisms are proposed for the formation of coagulum: (i) latex instability which triggers flocculation and growing of the aggregates to macroscopic size; (ii) an altered polymerization mechanism, e.g., polymerization in large monomer drops, or a distinct monomer layer in the vapor space above the latex and the reactor surfaces . The low coagulum values may designate that the primary particles were well protected by surfactant molecules from the beginning of polymerization. Particle accumulation, if any, was very restricted. It is worth mentioning that high solid content 50% and low coagulum are required for the production of styrene acrylate emulsion on a large scale, for industrial applications . Evaluation of the novel high solid content nano emulsion polymers (St-EHA) with co-polymer latex as a binder in waterborne household paints was carried out. In order to obtain latex paints a high-speed disperser (dissolver 492- from ERICHSEN GmbH) was utilized. The full amount of water for the formulation was added once the dispersing and cellulose thickener had been prepared. The disperser speed was increased up to 1000 rpm. Following this, the remaining pigments and filler were selectively added. Finally, the disperser speed was decreased and the latex dispersion, co solvent, and acrylic thickener were added slowly, to obtain full formulation homogenization. This is presented in FIG. 9, and all the ingredients of the paint formulation are recorded in TABLE 11. The samples of the prepared nano-copolymers were applied in emulsion paint formulations as a binder and evaluated for comparison with a commercial reference sample i.e. Arakril ADC 750. The results obtained for the wet scrub resistance test of the emulsion paint, based on the nano-copolymers as a binder, showed improved and higher values than the commercial reference sample (Arakril ADC 750). In addition, the level of gloss also displayed a noticeable improvement. The data is presented in TABLE 12. Table 12: Gloss and washablity of the coating film based on the prepared nano-copolymers. These include the dispersant, surfactant, pigment(s), latex and biocides. The thickening efficiency of the associative thickeners is impacted by the choice of some of these raw materials. In the low PVC formula we get a different viscosity for each sample, with the low particle size giving a high viscosity TABLE 13. The associative thickener associates with the latex particle to form a network resulting in viscosity build. The choice of latex used in a paint formulation can have an impact on the thickening efficiency of associative thickeners. There are different classes of latexes used in paint formulations. Latexes with a smaller particle size, and therefore higher surface area, will possess a larger number of association sites and therefore result in high viscosity paint, with the reverse being true for latex with a large particle size. When the Rheolate associative thickeners (HASE) are added to coating formulations, they organize into micelles and interact with other components within the formulation. Most important are the interactions between the hydrophobic units and the binder surface . This is not a chemical reaction but a temporary adsorption, and is responsible for the rheological activity. In water alone they give little structure until their micelles start to link (FIG. 8). The current study aimed to develop latexes with good properties for coating applications. The prepared polymers have a targeted Tg to improve the dry latex film properties. Prepared nano-copolymers were confirmed by IR, GPC, thermal analysis (TGA, DTGA and DSC), Zeta potential and TEM. Preparations of nano-copolymers were dependent upon different anionic surfactants (texapone and Desponil LDBS 25). Using these different surfactants in the experiments, provided particle stability throughout the reaction. Hence, the effect of the emulsifier concentration on the final conversion of monomer to polymer was studied. It was found out that the final conversion of monomer to polymer increased with increasing emulsifier concentration. The prepared (St /2EHA) nano copolymers were applied as a binder for waterborne house-hold paints and it was found that the investigated paint films had good mechanical properties. Therefore, the prepared nano-copolymers can be recommended for application in waterborne paints for exterior and interior household usage. Jena KK, Narayan R, Raju KVSN. New high performance waterborne organic?inorganic hybrid materials from UV curing. Prog Org Coat. 2013;76(10):1418-24. Gao J, Lv H, Zhang X, et al. Synthesis and properties of waterborne epoxy acrylate nanocomposite coating modified by MAP-POSS. ProgOrgCoat. 2013;76(10):1477-83. Landry V, Blanchet P. Wethering resistance of opaque PVDF-acrylic coating applied on wood substrate. Prog Org Coat. 2012;75(4):494-501. Abd El-Monem F, Hussain AI, Abd El-Wahhab H, et al. Nano-emulsion based on acrylic acid ester co-polymer derivatives as an efficient pre-tanning agent for buffalo hide. ARAB J CHEM. 2017;10:S3861-9. Hu J, Chen M, Wu L. Organic-inorganic nanocomposites synthesized via mini-emulsion polymerization. Polym Chem. 2011; 2:760-72. Qi D, Bao Y, Weng Z, et al. Preparation of acrylate polymer/silica nanocomposite particles with high silica encapsulation efficiency via miniemulsion polymerization.Polymer (Guildf.). 2006;47(13):4622-9. Chern CS. Emulsion polymerization mechanisms and kinetics, Prog Polym Sci. 2006;31(5):443-86. Nianwei, Y, Keqiang C, Wei K. Preparation of BA/ST/AM nano particles by ultrasonic emulsifier-free emulsion polymerization. Ultrason Sonochem. 2006 ;13(4):345-51. El-Sherif HM, Nasser AM, Hussin AI, et al. Novel Recycled Brown Paper Coatings. Egypt. J. Chem. 2017; 59(6):1-18. Unzue MJ, Schoonbrood HAS, Asua J.M, et al. Reactive surfactants in heterophase polymerization. VI. Synthesis and screening of polymerizable surfactants (surfmers) with varying reactivity in high solids styrene-butyl acrylate-acrylic acid emulsion polymerization. J Appl Polym Sci. 1997;66(9):1803-20. Nasser AM, Abd El-Wahab H, Abd El-Fattah M, et al. Preparation and characterization of modified reclaimed asphalt by using styrene-butyl acrylate nanoemulsion copolymer. Egypt J Chem. 2018;61(2):280-90. El-Sherif HM, Nasser AM, Hussin AI, et al. Nano Emulsion Binders for Paper Coating Synthesis and Application. J Macro Sci. 2017; 54(5):271-87. Shi Y, Shan G, Shang Y. Role of Poly(ethylene glycol) in Surfactant-Free Emulsion Polymerization of Styrene and Methyl Methacrylate. Langmuir. 2013;29(9):3024-33. Bukhari MM, Alyan AA, Hegazi SF. Nano emulsion miniemulsion copolymerization of styrene with methyl meth acrylate using hexadecane and dodecyl mercaptan cosu-rfactants. Jazan Sci J. 2014;4(1):30-45. Lovell PA, El-Aasser M S. Emulsion Polymerization and Emulsion Polymers, john Wiley & Sons Ltd, Chichester, 1997. Zhao K, Sun P, Liu D, et al. The formation mechanism of poly(vinyl acetate)/ poly(butyl acrylate) core/shell latex in two-stage seeded semi-continuous starved emulsion polymerization process. Eur Polym J. 2004;40(1):89-96. Okubo M. Polymer particles. Springer Berlin Heidelberg, New York. 2005. Chen W, Zhu W, Song M, et al. Morphological Characterization of PMMA/PAN Composite Particles in Nano to Submicro Size. Macromol Mater Eng. 2005;290:669-74. Cangialosi D, Alegría A, Colmenero J. Effect of nanostructure on the thermal glass transition and physical aging in polymer materials. Prog Polym Sci. 2016;54:128-47. Ismail H, Ahmad Z, Yew FW. Effect of Monomer Composition on Adhesive Performance for Waterborne Acrylic Pressure-Sensitive Adhesives. J Phy Sci. 2011;22 (2):51?63. Lee D. The effects of latex coalescence and interfacial cross linking on the mechanical properties of latex films. Polymer. 2005;46:1287-93. Guevin PR. Hardness in Paint and Coating Testing Manual. 1995; 14th edition, ed. J.V. Koleske, ASTM, Philadelphia, PA, Chapter 48. Achouri A, Zamani Y, Boye JI. Stability and Physical Properties of Emulsions Prepared with and without Soy Proteins. J Food Res. 2011;1(1):254. Kan CY, Liu DS, Kong XZ, et al. Study on the preparation and properties of styrene-butyl acrylate-silicone copolymer lattices. J. Appl Polym Sci. 2001;82:3194-3200. Huang SQ, Xu ZS, Peng H, et al. Properties of PHMS-g-P[butylacrylate (BA)-Nhydroxylmethyl acrylamide (NMA)] graft copolymer emulsions. J Appl Polym Sci. 1999;71:2209-17. Yang SF, Xiong PT, Gong T, et al. St?BA copolymer emulsions (BA)-Nhydroxylmethyl acrylamide (NMA)] graft copolymer emulsions, J. Appl. Polym. Sci. 1999;71. He WD, Cao CT, Pan CY. Formation mechanism of silicone rubber particles with core?shell structure by seeded emulsion polymerization. J Appl Polym Sci. 1996;61:383-8. Cao TY, Liu QP, Hu JS. Preparation, properties and applications of polymerlatexes. Chemical Industrial Press, Beijing, 1997. King AP, Naidus H. The relationship between emulsion freeze-thaw stability and polymer glass transition temperature. J Polym Sci. 1969;27:311-9. Bukhari MM, Alyan AA, Hegazi SF. Nano-emulsion (mini-emulsion) Copolymerization of Styrene with Methyl methacrylate (MMA) Using Hexadecane (HD) and Dodecyl Mercaptan (DDM) as Cosurfactants. J Human Appl Sci. 2015;4(1):1-15. Kong X, Zhu X, Jiang X, et al. Preparation and full characterization of cationic latex of styrene butyl acrylate polymer) Polymer. 2009;50:4220-7. Hussain AI, Nasr HE. The Role of Carboxylic Acid on the Characterization and Evaluation Seed Emulsion of Styrene/ Butyl Acrylate Copolymers Lattices as Paint. Nature Sci. 2010;8:94-103. Elementis Specialties. Rheology Handbook: 30th Edition. 2008;14-21.